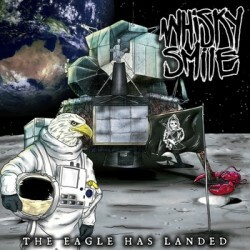 Whisky Smile is a heavy rock/metal band from down under, Sydney to be exact. It would be an obvious choice to let Metalrage contributor Gaz handle this review, since he hails from Australia if it wasn’t the case that he’s the drummer of Whiskey Smile. For me the task to stay objective and not to let the Metalrage ties cloud my vision/hearing. Whisky Smile’s music can be described as heavy rock with hints of metal (especially in ‘Cheap And Easy’). It has some Motorhead influences in it and because of the vocals it also has some Rob Zombie (sans electronics) resemblancs. The name couldn’t be more fitting to this style, since it’s really music that you want to grab a beer/whiskey to and party. There’s nothing really intellectual going on, but just plain old rock ‘n roll with an enormous groove. Music to have a good time to! One thing that directly stand out is the excellent production for a self-released EP. Really well done. For the follow up there’s maybe one minor thing that could use a little bit attention (though it doesn’t irritate at all) and that’s the production of the drums. Everything sounds fine, except for the hi-hat it stands a bit too much in the front of the mix. The vocals sound superbly and also the guitar tone is clear and not brought with a lot of distortion which is the norm these days. The Eagles Has Landed has quite some variety for an EP, without straying too much from the heavy rock path. In ‘Rock Lobster’ for example even a break down is coming along, which isn’t something that is done a lot in this kind of music, but it works. Also the gang vocals are done well in various songs and I like the way that all the songs tell a short story instead of being all abstract and artistic. It really suits this kind of music and it made me grin a few times. I don’t have a lot to complain about this self-released EP. It shows a band which clearly had fun while recording this disc. It’s nothing ground breaking though, but well executed. I am curious if a full length will still keep me as enthusiast, but that’s up to Whisky Smile to prove!